Compact but capable, subdued but edgy, old but new. 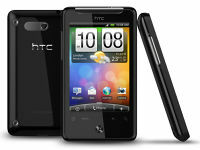 That’s the HTC Gratia. With Froyo greasing the cogs, the European version of the HTC Aria is more than a name change – this petite droid is getting ready to storm the Old Continent. The Android world is in a stage where big screens make the grade, which makes it frustratingly hard for people who like their droid in a small package. The compact Gratia comes with a 3.2” screen and is noticeably smaller than competing phones with the same display diagonal. Before we go on though, here’s the gist of what’s in store. Despite the clean, simple lines, the Gratia is recognizable enough thanks to the signature screws on the back. Some might confuse it with the HD mini, which originated the look, but Android’s explosive popularity means that the Aria/Gratia phones have far surpassed their PocketPC cousin. HTC have put their magic touch on the HTC Gratia interface – the Sense UI is elegant and highly usable, with special focus on social networking. The speed boost from running Froyo rather than Eclair is a major advantage and Flash support in the browser is relatively rare in the midrange. The Gratia software is certainly one of the highlights but the hardware deserves praise as well. The phone is solidly built and feels sturdy in the hand, without being bulky or heavy. Okay, enough warm up – time to jump into the review. On the next page we start with opening the box and examining the contents. After that, our tour of the exterior begins.